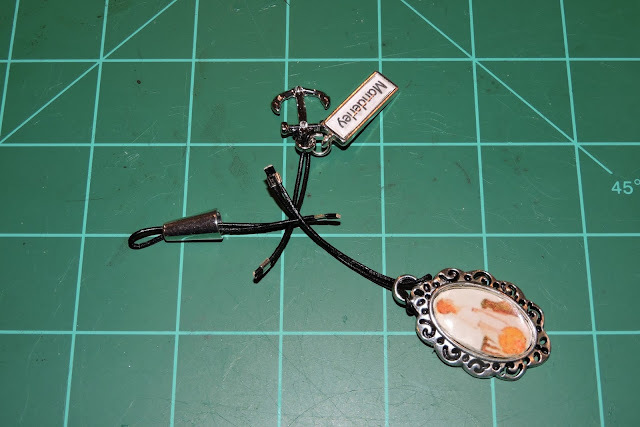 Get out your round nose pliers, Lorraine Masonheimer is here for Crafty Thursday and she's going to show you how to make a charm you can attached to a cell phone or your favorite purse. 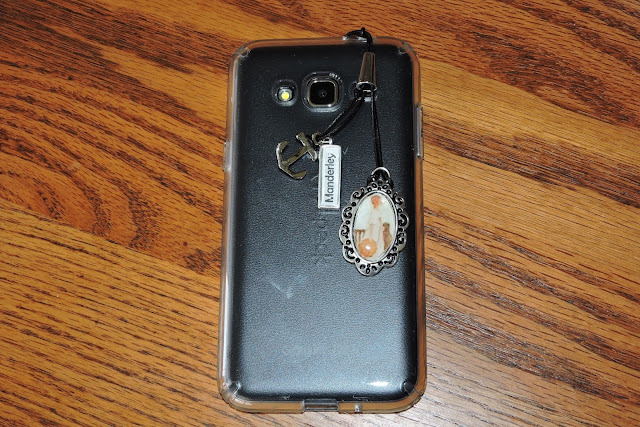 The cell phone charm is an ode to Daphne de Maurier’s book Rebecca. The oval frame shows Rebecca in her famous white gown and flowing hat worn to a costume ball the year before her death. A costume that Mrs. Danvers, the sinister housekeeper, manipulates the new Mrs. de Winter into wearing a year later. The rectangular frame identifies Maxim de Winter’s Manderley estate where Rebecca’s murder takes place. Lastly, the boat anchor represents Rebecca’s watery grave in her beloved sailboat. Make a color copy of the cover of Rebecca by Daphne de Maurier. The book is reasonably priced on Amazon.com. Reduce image to ¾” wide and 2” long or to the size of the charm you’ve chosen. Copy the image onto glossy photo paper. Place the oval frame protective cover over Rebecca. Trace, cut, glue into the metal frame and seal with the protective cover. If a cover isn’t included in the frame you’ve chosen, use Glossy Accents Clear Dimensional Medium to seal and protect the image and let dry. 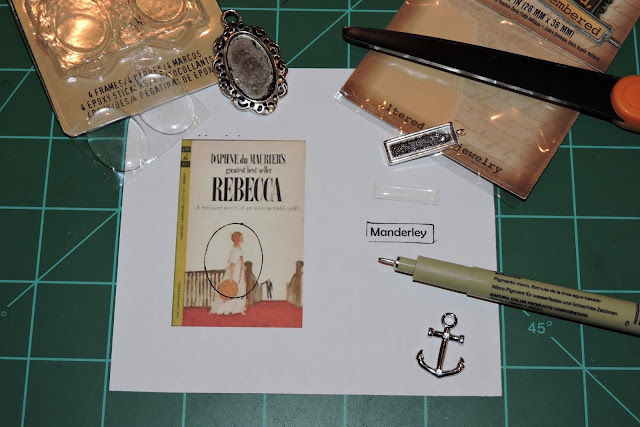 Type the word Manderley to ¾” long and ¼” wide or to the size of the rectangle charm you’ve chosen. Place the rectangle frame protective cover over the word. Trace, cut, glue into the metal frame and seal with the protective cover. To make the strap, cut a piece of leather cord to 5 ½” long and fold in half. Thread the loop through the bead cone as shown. Thread both ends of the cord through a crimp tube, crimp, trim and set aside. To make the two danglers, cut a piece of leather to 5”, fold in half and thread loop through the oval frame. Feed both ends through the loop, pull to tighten to create a cow hitch knot and set aside. Cut a second piece of leather to 4 ½” and repeat to secure the anchor charm. Open a jump ring by inserting the round nose pliers and slowly separate the ring. String the rectangle Manderley charm onto the ring. String the anchor charm onto the ring and close it using the pliers. To attach a dangler charm, thread one end of the cord through the middle of the strap beneath the cone. Bring the other end of the cord over the top of the strap forming an enclosed circle. Thread both ends of the cord through a crimp tube, crimp and trim. Repeat to attach the second dangler as shown. Lightly pull the danglers to hang below the strap. Slide the cone to the bottom of the strap covering the mechanics of the two dangler charms. 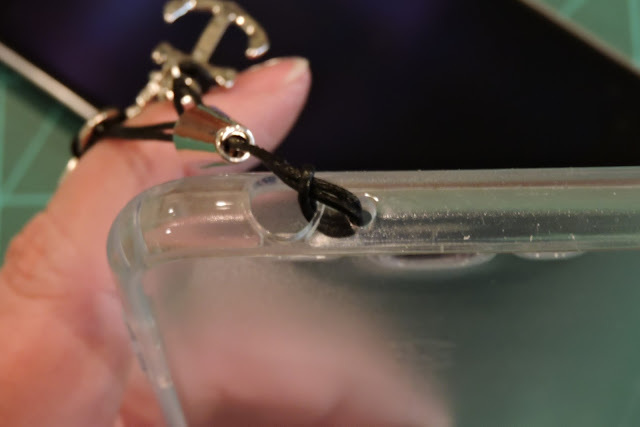 Attach the completed strap to the cell phone by looping it through the attachment holes in the cell phone case using a cow hitch knot as shown. Pull to tighten to the back of the case to prevent scratching the screen on the front of the phone. Tuck the cell phone into the case and enjoy. 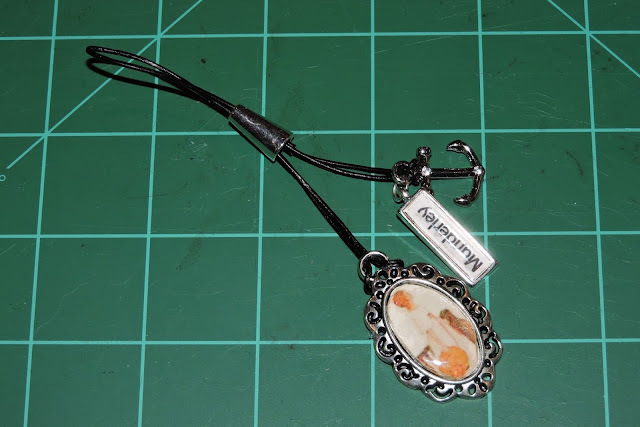 If you prefer a one dangler charm, purchase a pre-made charm strap from jewelrysupply.com and attach using a jump ring and round nose pliers. 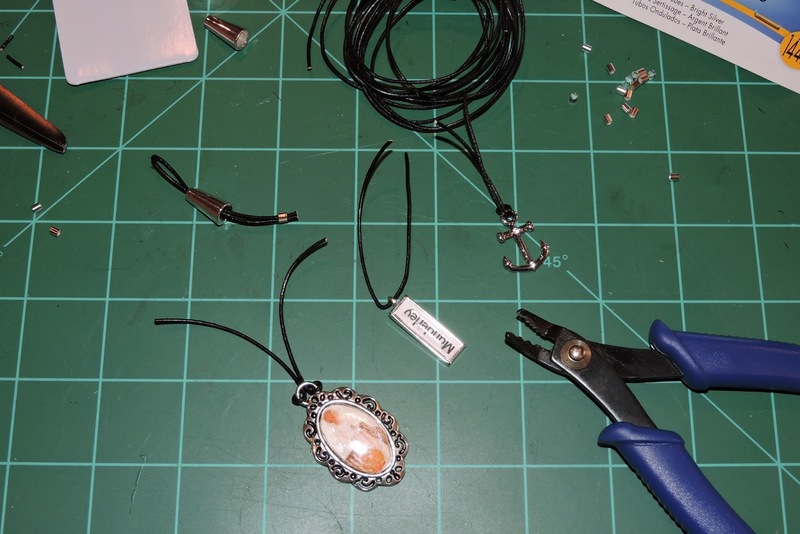 Option: To make a purse charm instead, cut the leather cords to longer lengths to customize to your purse. Love crafty Thursdays. Thanks for the inspiration and instructions. Thank you, Barbara! We have a lot of fun doing them.